Madeleine Albright inspired each of us who heard her speak at the Women’s Executive Summit. On a personal level, her talk has made me think about the mixture of the extraordinary and ordinary which defines us and our legacies. When leafing through the weekend section of the Washington Post, I came across an announcement of the National Women’s History Museum’s Gala Celebration, to celebrate women’s heritage, through the Christine de Pizan Honors, named after the first woman to write about women’s history in 1405. 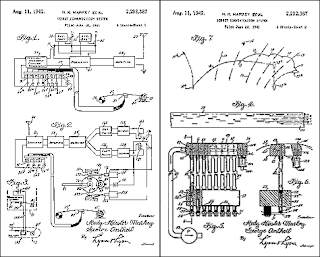 What caught my eye, as a satellite and telecommunications lawyer, was one of the posthumous honorees who invented a new system for spectrum frequency hopping and spread spectrum, then-intended for a “Secret Communication System” which could have been used by the US in the war effort. It is said that her ideas were not implemented as, at the time, she was not taken seriously. Later, however, this invention has been cited as the principal anti-jamming device used today, for example, in the U.S. government's Milstar defense communication satellite system, as well as the part of the foundation of much of our wireless communications industry. Below are two pages of drawings from U.S. Patent # 2,292,387. There are a lot of directions I could potentially go with this, but I’ll just say: each of us has greatness within. And I have not found nearly as lovely a pin in any Hedy Lamarr photo as I have in Secretary Albright’s.